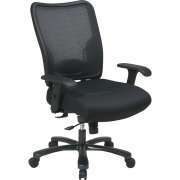 What kind of office chair is breathable? 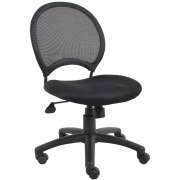 Mesh office chairs are strong and durable but allow for full breathability and airflow. 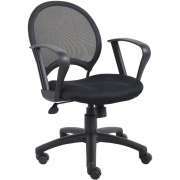 They also give constant firm support to the back for more productive work hours. 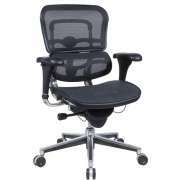 The practical features of mesh computer chairs are complemented by attractive contemporary designs that will fit well in any workspace. 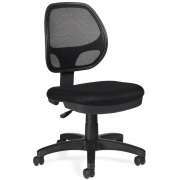 Hertz Furniture&apos;s selection of ergonomic mesh office chairs can match any style or budget. 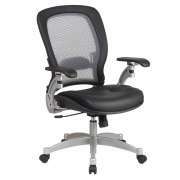 It features a range of adjustable ergonomic features that create a custom fit for all-day support. 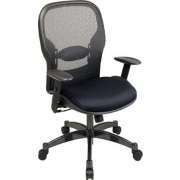 From the contemporary mesh design to the ergonomic comfort benefits, mesh back office chairs are the way to go. 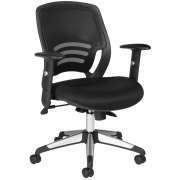 What kind of office chairs are good for a tech company? No matter what industry your company is a part of, having a modern work space that projects innovative ideas will make a positive impression on potential clients. With a fresh new look, you can demonstrate that your organization is up to date and equipped to handle the world of modern business. 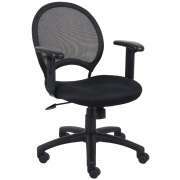 Mesh office chairs are the ultimate choice for the tech-savvy company. They provide the best support for professionals who spend extensive amounts of time working on computers but have a sleek appearance that keeps an office looking professional. 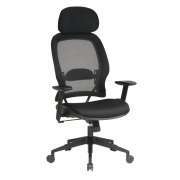 What kind of ergonomic features do your mesh office chairs have? 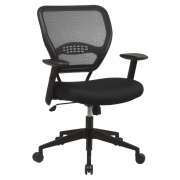 Style and support must go hand in hand in order to yield the ideal mesh computer chair. Executives and entry-level programmers alike need to work in a proper position throughout the long workday in order to ensure maximum productivity. 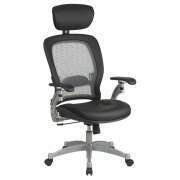 Ergonomic features such as pneumatic seat-height adjustment, an adjustable locking tilt angle, armrests, lumbar support and a headrest enable individual employees to achieve a custom fit. Without proper support, anyone who works at a computer all day can easily suffer from aches and pains that will last long after they have left the office. Professionals aren&apos;t the only ones who need to be positioned properly when working at a computer. Whether you have a few desktops in the library, or a fully-equipped school computer lab, it is important to make sure that children learn proper positioning from their earliest stages of computer use. Students who learn how to sit correctly and type properly while experiencing blended learning will carry these important skills throughout their lives. Whether you are offering courses in advanced programming and STEM education, or just teaching the fundamentals of typing, having computer chairs that facilitate correct positioning is critical. 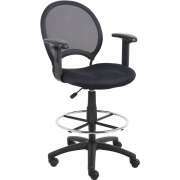 Can you get mesh conference chairs? While permanent seating in executive offices should always be a priority, there are other areas of the work space that can benefit greatly from the comforts of mesh chairs. When people come to a conference or seminar, they need comfortable seating that will allow them to focus on the content of the programming. Mayline&apos;s mesh guest chairs are designed to promote comfortable sitting so professionals can enjoy presentations rather than worrying about physical positioning. 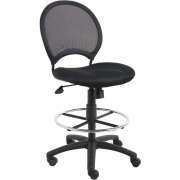 The chair seats fold up for compact nesting, so you can save space in storage when chairs are not in use. 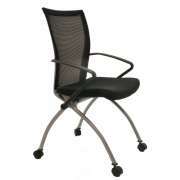 Whether you are selecting task chairs or guest seating, appearance is an important factor in the decision process. 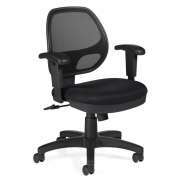 While black mesh back office chairs do have a sleek elegance to them, they can also make a space quite dark. Luckily, dark isn&apos;t your only option. Mesh chairs are available in a selection of seat and back colors which create a tasteful way to add a touch of hue to a professional or educational setting. When people are sitting at office desks all day, it is nice to have some color around to keep things bright and cheery. 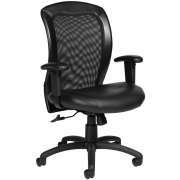 Can I get an office chair that has leather and mesh? While modern mesh material is ideal for a computer user, many companies still enjoy classic professional design elements. 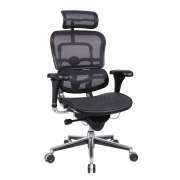 We offer some sleek mesh office chairs that have leather seats so you can get the best of both worlds. With a combination of leather and mesh, contemporary style blends seamlessly with the elegance and luxury of stately leather. At Hertz Furniture, we know how to find the perfect combinations of style and support. 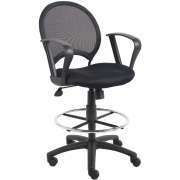 Our mesh office chairs are designed to look and feel great no matter who is sitting in them. 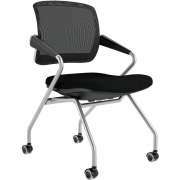 When you are deciding between a number of similar mesh seat office chairs and need some assistance to make the right choice, contact the Hertz Design Center for free project-planning advice.